"Hate will never win," James Corden said. "Together, we have to make sure of that." Corden began Sunday's 70th annual Tony Awards with a heartfelt message about the horrific terror attack in Orlando, Florida, that had unfolded 18 hours earlier. He said "tonight's show stands as a symbol and a celebration of that principle." Immediately following Corden's remarks, the cast of "Hamilton" performed an opening number on stage, with one significant change: Their usual prop muskets were set aside. 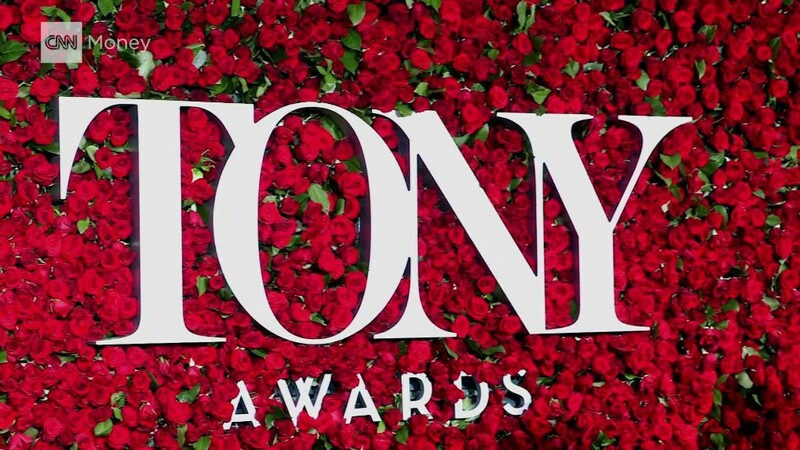 The Tonys, Broadway's biggest night of the year, began on time at 8 p.m. ET, televised by CBS. "The Broadway community really wanted to continue with this, as did we," CBS chief executive Les Moonves told CNNMoney. "It's important that the show go on. And the show's being done in honor of the victims." One of the early Tony winners, Lin-Manuel Miranda, the creator of "Hamilton," held back tears during his impassioned acceptance speech Best Original Score. The "Hamilton" star's speech was an emotional reading of a sonnet he wrote for his wife which focused on the mass shooting that took place in Orlando early Sunday morning. "When senseless acts of tragedy remind us that nothing here is promised. Not one day," he read. And the sonnet concluded: "Love is love is love is love is love is love it cannot be killed or swept aside. It cannot be killed or swept aside... now fill the world with music, love, and pride." Outside, the scene on the red carpet before the program began was noticeably subdued. Still, hundreds of fans shouted as Broadway stars arrived and posed for photos. Some attendees wore silver ribbons to commemorate the terror attack. And a few dozen members of the group Everytown for Gun Safety held up signs with messages decrying gun violence. Corden set the tone for the evening by saying, "On behalf of the whole theater community and every person in this room, our hearts go out to all of those affected by this atrocity. "All we can say is, you are not on your own right now," he said. "Your tragedy is our tragedy," Corden said. "Theater is a place where every race, creed, sexuality, and gender is equal, is embraced, and is loved." Corden was responding to the shooting spree at the Orlando gay nightclub Pulse, which left 49 dead and injured dozens more. It is the worst mass shooting in U.S. history. Frank Langella echoed those feelings when he accepted the award for Best Actor in a Play for "The Father." Rather than thank a "litany of names," Langella said, "Today we had a hideous dose of reality and I urge you, Orlando to be strong because I'm standing in a room full of the most generous human beings on Earth and we will be with you every step of the way." Before presenting "Hamilton" with the Tony for Best Musical, Barbra Streisand said, "Tonight our joy is tinged with sorrow," but was "thankful" for the artists, composers and performers in the room because "in times like these they console us." "Tonight, every note I sing will be in remembrance of the lives taken in Orlando," actress and Tony nominee Laura Benanti tweeted Sunday afternoon. While she was preparing, longtime Tony voter Colleen J-Roggensack wrote, "I am reminded theatre heals and tonite we will celebrate the good in the world." When the attack was first reported, there was speculation that the show or the red carpet might be delayed or changed in some way. Moonves confirmed that discussions took place early Sunday morning about what to do. But the organizers said in a mid-morning statement that the show would go on. "Our hearts are heavy for the unimaginable tragedy," the producers said. "Our thoughts are with the families and friends of those affected. The Tony Awards dedicate tonight's ceremony to them." The first comment from the man who's expected to be the biggest winner of the night, "Hamilton" creator and star Lin-Manuel Miranda, was an image of a rainbow-colored heart and the word "Orlando." "When will the violence end?" Chenoweth asked via Twitter. "Hamilton" won 11 awards at Sunday's Tonys coming up just short of the record. It won the big award of the night, Best Musical. The show's Aaron Burr, Leslie Odom Jr., won for Best Lead Actor in a Musical. -- CNN's David Shortell contributed to this report.